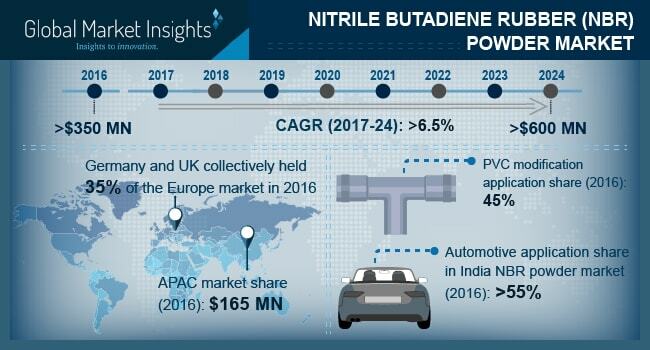 Nitrile Butadiene Rubber (NBR) Powder Market size will surpass USD 600 million by 2024; according to a new research report by Global Market Insights, Inc.
Nitrile rubber powder market is majorly driven by the rapid usage of adhesives, gaskets, and sealants in industries such as marine, aerospace, rail and refinery, packaging, automotive and others consume seals and gaskets. Adhesives are extensively used in industries such as packaging, automotive, construction, footwear and furniture. New regulations in automotive & aerospace industries regarding use of lightweight materials to increase the overall efficiency will drive the adhesives, sealants and gaskets demand in future. Phthalates are cost effective esters and generally find usage in NBR compound as it enhances the low temperature performance. The di(2-ethylhexyl) phthalate (DEHP) was the most commonly used ester earlier, however with advent of newly formed regulations in Europe and North America regarding restricted usage of this ester, the market of nitrile rubber powder can be seen to grow at a reduced rate than expected. The 0.70 – 1.00 mm particle size segment of nitrile rubber powder market is forecasted to grow at a fastest CAGR owing to industry acceptance of 1 mm maximum size in dust particles. The segment is said to grow with leaps and bounds to secure a second position in the NBR powder market with a share of over 15% by the end of 2024. China made linear grade NBR powder market is said to grow considerably to surpass USD 17 million by the end of 2024. The product grade finds major application in gaskets, seals, hoses among others. Automotive industry is one of the major drivers for this segment in the Asia Pacific region. In 2017, new vehicle sales in China and India accounted for over 29 million and 4 million respectively. PVC modifications is the largest applications segment in the global nitrile rubber powder market owing to its huge applications in the refrigerator sealings, PVC hose, and other low temperature resistant products. Presence of giant industries in Asia-Pacific & North America, led by the U.S. & China will drive the product segment demand in the respective regions. The U.S. PVC modification segment for NBR powder market is estimated to surpass USD 20 million by the end of the forecast period. Construction industry in Asia Pacific region, led by China, Japan, and India accounted for over USD 4 trillion in 2016. Growth in construction and infrastructural development in the Asia Pacific region will spur the NBR powder market in future years. The NBR powder demand in construction end use segment in China will grow with a CAGR close to 7% to capture over 15% market share by 2024. In terms of volume, the automotive sector holds the highest market share and is expected to grow with a CAGR of over 5.5% from 2017 to 2024. The North American NBR powder market which majorly includes U.S. will surpass USD 60 million by the end of 2024 owing to presence of huge automotive industry in the region. Europe will witness growth at a slower rate than North America due to stringent regulations. Key nitrile rubber powder market players functioning in the industry include Nitriflex, Zeon Chemicals, Lanxess, LG Chem, Taprath Polymers, and Omnova Solutions among others. Zeon Chemicals recently launched a new range of NBR elastomers which has oil and solvent resistance properties. The new range offers great balance of cost and performance for the most challenging chemical, heat, and oil applications.